•	create, generate and distribute of time scale publications, including books, information websites, charts and wall-chart posters. •	maintain a high level of responsibility to the Foundation donors for fund investment and expenditures. Earth’s history is a fascinating topic. The Geologic TimeScale Foundation strives to provide the global public and geoscience community with quick and free access to a wealth of information about our planet’s past. (1) GSSPs – The divisions of geologic time, such as Jurassic or Danian, are defined at a Global Boundary Stratotype Section and Point (GSSP) that marks the international reference for their base. We have compiled summary tables and graphics for all ratified GSSPs and pending candidates. 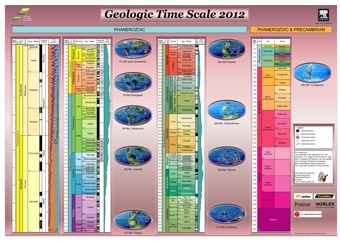 (2) CHARTS & BOOKS – From the popular page-sized geologic time scale to poster-sized Earth’s history, all in official colors. 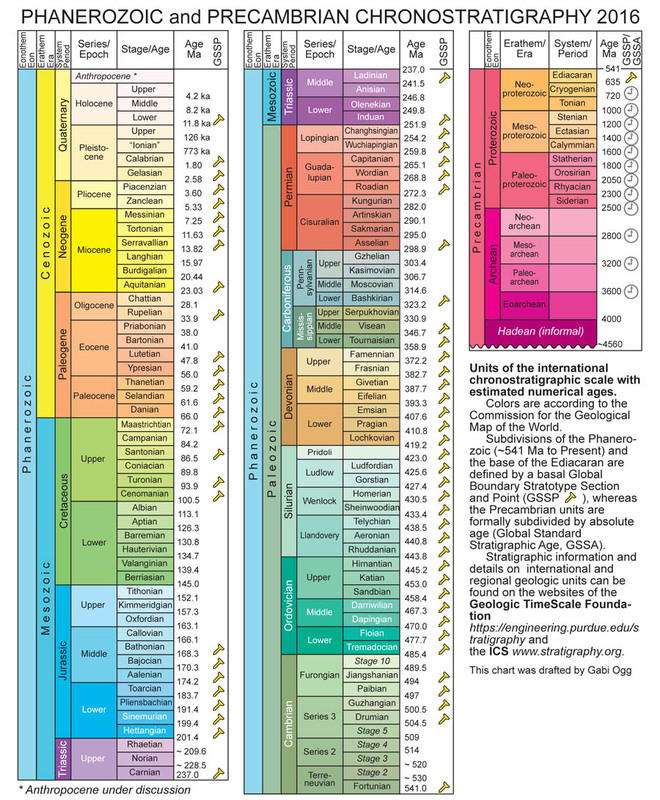 (3) STRATIGRAPHIC GUIDE – a concise version of the official manual. (4) RESOURCES – including diagrams of inter-regional correlations, links to lexicons (national rock formations), “GeoWhen” database of historic and regional stage names, and selected links to other Earth history sites. (5) TS-CREATOR – our Time Scale Creator visualization package (free JAVA program for all platforms) enables you to explore relationships and make custom charts from a database suite of over 20,000 biologic, geomagnetic, sea-level, and other events. Plus, you can load datapacks ranging from British Isles geology to New Zealand fossil ranges. On-screen displays have extensive hot-links to provide additional information. This corporation is organized exclusively for charitable, scientific and education purposes within the meaning of Section 501(c)(3) of the Internal Revenue Code of 1986, as now enacted or hereafter amended, including, for such purposes, the making of distributions to organizations that also qualify as Section 501(c)(3) exempt organizations.